A home typist (or transcriptionist) types documents from his or her home office, typically using audio files as the source. However, that's not quite enough of a job description because these home-based jobs can cover many types of transcription jobs — everything from "microjobs" in data entry to specializations that require additional training, such as medical transcription. Also, not every kind of typist job is as likely to home-based; for instance, court reporting isn't. However, the skills that one develops as a court reporter can be valuable in obtaining some of the most lucrative at-home typing work: realtime transcription and captioning. Read on for more about those professions. Obviously fast and accurate typing skills are an important requirement, but how fast you need to be may vary considerably. Unskilled data entry jobs accept home typists with speeds as low as 60 wpm (and paying them at the low end as well) and realtime transcription jobs, or captioning from home, require speeds as much as 300 wpm. Also, good hearing and listening skills and the ability to understand accents are important when transcribing audio files. Knowledge of proper spelling, punctuation, and grammar is a must. Computer skills that go beyond simply using word processing software are necessary for the home typist. Those in these positions may have to install new software, log on to a company's system remotely, upload files, troubleshoot issues with his or her own computer, etc. As with most work-at-home jobs, companies typically prefer to hire home-based typists with previous on-site experience; often two years are required. However, since some companies pay based solely on the typist's output, these companies may be willing to take on a beginner, but the pay is low. Most transcription jobs do not require post-secondary education or special certification. However, the exceptions include medical transcription and court reporting, which do require certification. Nevertheless, classes and training in office software may be helpful for any home typist. Keep in mind, though, that some work-at-home scams can be dressed up to look like online training, so be wary of any job posting that tries to sell you, classes. Transcribers are commonly hired as independent contractors, but a few companies may hire them as employees. The more skills and education that the job requires (e.g., medical transcription, captioning) the more likely it is an employment position. Independent contractors may be hired for temporary jobs during peak periods. Some companies will post available work for its contractors to accept on a first-come-first served basis. Similar to how data entry jobs pay, transcription is very often paid at a per-piece rate, even for employees. However, employees must be paid at least minimum wage. The "piece" that transcription pay rates are based on may be per page, per audio minute or per word; for example, rates might be $.005 (or a half a cent) per word. The hourly rate that this will work out to may vary based not only on your skill and stamina but also on the difficulty of the work. Most companies may require skill tests during the hiring process. These tests are usually for more than just speed, but they also test accuracy, grammar, spelling, and comprehension. 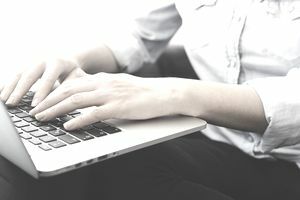 To see how you rate, check out these free typing tests and practice files for transcriptionists. It varies from company to company. Some home typing jobs will require that you have child care for children not old enough to care for themselves. These are often the jobs that require a quick turnaround or are real-time transcription or captioning. However, many typing jobs have very flexible schedules, and you may not "need" childcare, though you may earn more if you are not interrupted by the needs of children. Is Captioning the Work-at-Home Job for You? Do You Have What It Takes to Be a Virtual Assistant? Which Transcription Jobs Can be Telecommuted?